Importance. - This sawyer occurs throughout the eastern and southern United States and is destructive to pine logs held in storage or pines killed by natural or manmade catastrophes. Identifying the Insect. - Adult beetles are mottled gray and brown from 1 to 1 1/4 inches (25 to 31 mm) in length and have antennae which are 2 to 3 inches (50 to 75 mm) long. Full-grown larvae are legless and whitish yellow in color and up to 2 2/5 inches (60 mm) long. Identifying the Injury. - The first signs of attack are the funnel shaped pits or egg niches in the bark. Removal of bark from infested wood will reveal coarse, excelsiorlike wood shavings, and sculptured wood. 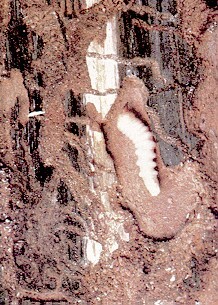 Elliptical shaped holes tightly packed with excelsior-like frass indicate that the larvae have bored into the sapwood to construct the pupal cell. Round, pencil-sized holes in the wood are exit holes. Biology. - The adult beetle deposits one to several eggs in the cambium area through the egg niches. After hatching, the larvae feed on the surface of the cambium then bore into the sapwood and heartwood. After pupation is completed, the adult beetles chew through the wood, making the round exit holes. There are at least three generations per year in the southern United States. Control. - Rapid utilization of dead and dying trees and green logs will reduce infestations and losses caused by this beetle. When large numbers of trees require storage, they may be sprayed with an insecticide or debarked. Logs stored in water may also prevent serious damage.